Back in early November, I reported upon the impending of arrival of upmarket chocolatier Hotel Chocolat to Newcastle’s Blackett Street – the retailer’s first standalone high-street store in the North East. The store opened for business on 26 November and I dropped in for a look just before Christmas. So, how does it check out? From the street, the shopfront and signage is elegant and understated, but the attractive yet restrained window displays do a good job of grabbing the attention of passers-by, while always allowing a clear view into the shop – and of the chocolate delights inside. Once over the threshold, the first thing to remark upon is quite how tiny the store is. However, it manages to fit a lot into the shelves around the edge of the shop, while avoiding cluttering up the middle of the floor – an important point given how busy the shop was when I visited. As with the outside of the store, a sense of elegance and simplicity runs throughout the interior, allowing the attractive product to very much be the centre of attention. Having chosen my treats (actually a gift for the other half), I went to the counter where two staff were serving at the time of my visit. The girl who served me was delightful – really warm and chatty – and seemed genuinely interested in me and my purchase. It was a refreshing change from too many other shops I’ve visited recently (that includes you, Peacocks in Monument Mall), where the staff have managed to converse with each other during the entire transaction, only bothering to acknowledge my presence at the point where they’ve required payment. The excellent attention to detail carried through to the store’s packaging – a simple paper carrier bag bearing the Hotel Chocolat logo, and reinforcing the feeling of quality – and to the friendly boy at the door who bade me farewell as I left the shop. 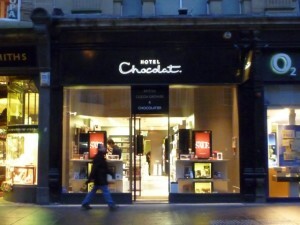 The whole point of Hotel Chocolat is that it’s not somewhere that you’ll shop all the time – unless you’re especially well off and have a thing for very decadent chocolate. It’s perfect, however, as a place for gifts or the occasional treat – and if the customer experience is this good every time, I’ll definitely be back. Previous story Can anyone remember Ashbourne’s long-closed Woolworths?